"Don't wait until you feel positive to move forward. Act your way into feeling good. That's the only way to start thinking more positively about yourself... if you've been inactive for a long time, getting started is hard to do. The good news is that as soon as you start moving, it gets easier." I find this quote to be very true. Especially during the cold months, I typically have more days where I don't "feel" like doing much of anything. Or I'm sure many of you have experienced a "falling out" with going to the gym or making healthier food choices. It can be really hard to get back in the groove again. If possible, it's definitely easier to keep up versus catch up. I like that this concept can apply to many areas of life. Maybe you're a designer or writer and a piece of your work was turned down. It can be natural to want to give up or take a break for a while, right? "Rejection" is never fun, especially with something that you've put your heart into. But it is true that it's hard for good things to happen when we're not doing. Action is typically required. Pick an area in your life that you don't necessarily feel positive about and find a way to "act your way into feeling good." For example, if you don't feel positive about your outward appearance, don't wait until you lose 20 pounds to find clothes that fit and you feel great in, or maybe try out a new hairstyle. There are tons of options to find great clothes that are affordable. It really is amazing how the positive energy you experience from feeling good in your clothes can transfer into making more healthful eating decisions, which can lead to improved body composition. Maybe you want to eat healthier lunches, possibly eat out less. A way that you can act your way into feeling good is to do a little meal or snack prep. 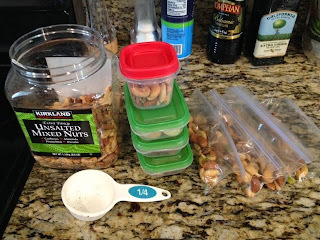 I've got pictures here of fruit and nuts that I pre packaged so that lunches or snacks were really easy to put together. 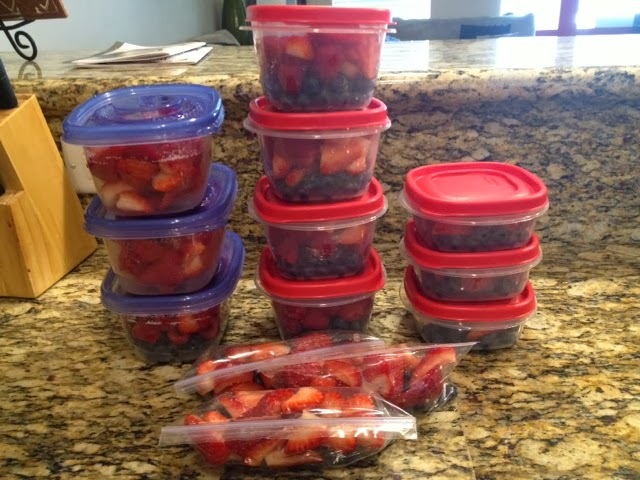 This probably only took me 15 minutes and definitely saves time and the waistline later! Another favorite of mine, is to make a little extra dinner so that I can have leftovers for lunch. You put the effort into making it, so why not reap the fruit of your labors a little longer? Small actions can swing great big, positive changes. What positive change are you going to work on today to "act your way into feeling good?"